Inzamam-ul-Haq, the chief selector of Pakistan Cricket Board, has announced Pakistan A Vs Australia Warm Up Match Squad. The 4-day warm-up match will be played in ICC Academy in Dubai from 29th of September till 2nd October. 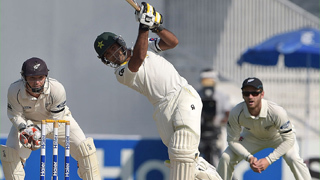 Asad Shafiq is announced as captain of Pakistan-A for the warm-up against Australia. This can be considered as a smart move as Asad Shafiq is an integral part of Pakistan’s Test team. After the retirements of two stalwarts of the middle order, a heavy responsibility lies on his shoulders to give stability to Pakistan’s batting. Basically, warm-up matches are scheduled for the visiting teams to get accustomed to the conditions and get good match practice, but it also serves a chance for the home nation to test some of its untested players. For Pakistan, these matches are more important because Pakistan is no more scheduling constant A-team tours. So this match against a quality Australian attack will provide chances to Pakistan’s rising players to show their capabilities. In turn, a good performance here may provide some players International call-up. Tim Paine will lead the Australian squad which will be keen to show a good performance, keeping in mind the hammering they suffered the last time they visited UAE to play Pakistan. That was the old time now as Pakistan have slipped quite remarkably in form and in rankings in the longer format of cricket. But Australia generally does not play spin that well and they will also be missing their two best batsmen in Steve Smith and David Warner. How will this team cope up with Yasir Shah and company is there to be seen as the first test between Pakistan and Australia starts on 7th October in Dubai. Here we have provided you the Pakistan A Vs Australia Warm Up Match Squad. When the match will start on 29th September, you can also check Pak Vs Aus live score with latest news and updates. Originated in Britain, Cricket became a popular sport in the sub-continent during the English rule. Since then it has grown in different parts of Asia and it is the most popular sport in Asian countries especially in India and Pakistan. Other than Asia, Australia, South Africa and New Zealand are the top cricket teams to name a few. Every fan of cricket needs to remain update with the latest cricket news and live cricket scores. You don’t have to worry about that now as you’ll get the live cricket score, latest updates about every match, breaking news about cricket and live cricket score today of every International match here at CricEtic. You will find alluring and attractive articles and blogs about trending cricket topics, team and match reviews, and player interviews as well.